Disgruntled MDC members yesterday scaled up calls for deputy president Elias Mudzuri’s expulsion from the party for attending a meeting at State House with President Emmerson Mnangagwa on Parliament business as internal wars in the opposition party escalate. MDC youth wing secretary-general Lovemore Chinoputsa led the call for Mudzuri to be expelled from the MDC for what other members termed “being a sell-out” and supping with the devil after he attended the parliamentary presiding officers’ meeting called by Mnangagwa. MDC legislators and party leaders have said they do not recognise Mnangagwa’s presidency. “This marks the end of the road for our vice-president. You can’t keep defying the party time and again. By choosing Mnangagwa over the party, VP Mudzuri has effectively expelled himself from the party. It was a pleasure working with you Elias. Hambe kahle [farewell]!” Chinoputsa said on his Twitter account. Mudzuri was the only opposition politician among Zanu PF’s high-ranking officials. The MDC Senator joined the delegation which was led by Speaker of the National Assembly Jacob Mudenda and Deputy Speaker Tsitsi Gezi, Senate president Mabel Chinomona and her deputy, Senator Michael Nyambuya, who was represented by Chief Fortune Charumbira. In his response to the attacks, Mudzuri said he attended the meeting in his capacity as leader of the opposition in the Senate under the Parliamentary Standing Rules and Orders. “It is with sadness and unfortunate circumstances that my fellow junior parliamentarians would want to play petty politics on something that is part of my terms of reference as a party deployee. My confusion to all this stems from the fact that if what I did was ‘illegal’ to my fellow parliamentarians, then I want to understand what we are still doing in Parliament as a party and wasting taxpayers’ money,” Mudzuri said in a statement. Other MDC MPs such as Charlton Hwende and Murisi Zvizwai also accused Mudzuri of being a sellout, but the former Harare mayor, who is touted as a potential challenger to party president Nelson Chamisa, said he had done nothing wrong. “I went to State House, not to appease President Mnangagwa, but to respect the office of Parliament. If I am wrong and they are right I would be proud to be fired from the party because I represented the party in Parliament business. It’s sad that my very colleagues were fully engaged in Parliament business at HICC (Harare International Conference Centre) on post-budget consultations, a budget presentation that saw MPs under attack from police. What hypocrisy!” Mudzuri said. After the meeting, Mudzuri was interrogated by party legislators at HICC, where the party had joined Zanu PF MPs for a post-budget seminar, although the MPs were kicked out of the budget presentation last Thursday for refusing to recognise Mnangagwa as President of the country. Hwende, the chairperson of the Parliamentary Portfolio Committee on Information Communication and Technology accused Mudzuri of being a sellout, who was now dining with the enemy. “How do you go alone as an MDC member, alone, why? Were you not ashamed, being alone there?” Hwende asked, to which Mudzuri calmly responded that he was not ashamed of anything. 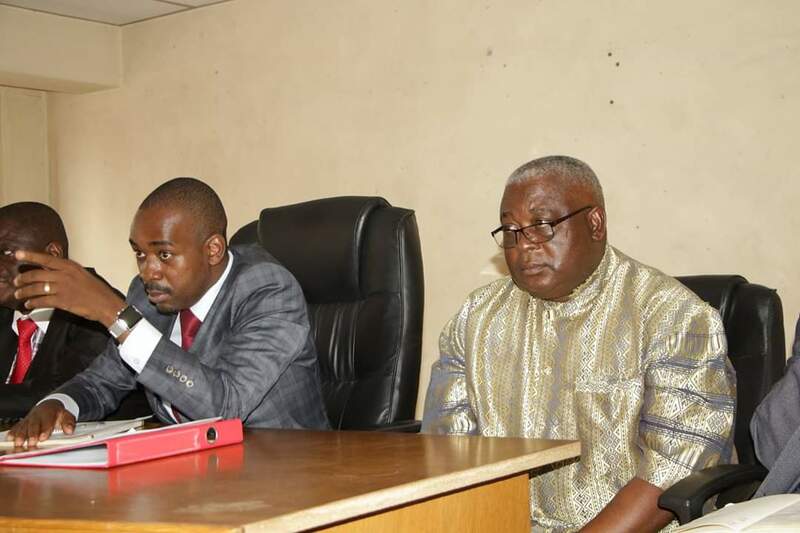 Hwende accused Mudzuri of endorsing Mnangagwa, an allegation he countered by asking if the MDC MPs’ attendance to parliamentary business meant endorsing Mnangagwa’s regime.